Description: The ground colour of this nudibranch is translucent white through to cream. The dark pigment spots on the cerata are comma shaped, not round as in other species. The terminal tubercle is considerably longer than the other ceratal tubercles. The back and flanks of the animal are heavily streaked with brown pigment. There is an unpigmented stripe between the ceratal bases. 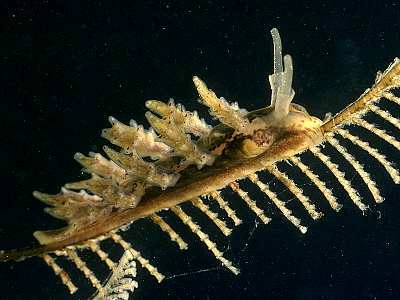 Habitat: The food of this species is the plumulariid hydroid Aglaophenia pluma which is common in shallow water, often growing on the brown seaweed Halidrys siliquosa, but also on rock surfaces. The spawn is a short folded ribbon. Distribution: Although only recently recognised as a distinct species, this is a widely distributed and not uncommon animal, recorded from Spain to Scotland. Comma shaped dark spots on ceratal tubercles. Brown body pigment with pale lateral stripe. Picton, B.E. & Morrow, C.C. (2016). Doto koenneckeri Lemche, 1976. [In] Encyclopedia of Marine Life of Britain and Ireland.